Keratin treatments have become a rage for the promises they make – to de-frizz and tame uncontrollable curly hair! However, these treatments have also been very controversial for the alleged harmful effects they may have. In this article, we’ll straighten out all the facts and myths about the famous Keratin treatment. So How Exactly Does the Keratin Treatment Work? 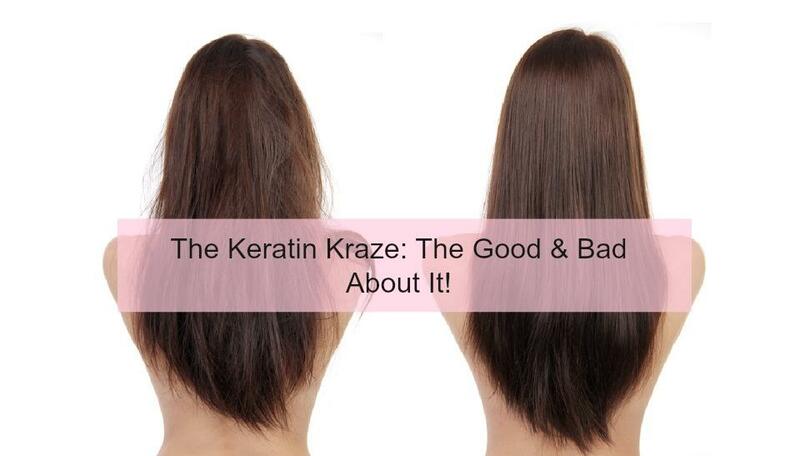 Keratin is a protein that occurs naturally in our hair. By applying a formula containing Keratin and sealing it in with a hot iron, the hair shaft is made more resilient. It is expected to last anywhere from 2-5 months depending on your hair texture, and history of chemical treatments! The controversy arises because most Keratin treatments contain formaldehyde – a chemical agent considered to be a carcinogenic (cancer causing agent). Most big and reputed brands use safe amounts of this agent that should pose no health risk to you or your stylist; however, there are chances of irritation and allergy being caused. Even if the product doesn’t directly list formaldehyde as an ingredient, it may contain methylene glycol, formalin, methanal, and methanediol. These ingredients mix with heat or water to release formaldehyde. It is impossible for this treatment to work without any amount of this agent as Keratin alone will not be able to break the bonds of your hair – the very process that causes ‘smoothening’. The best way to ensure your protection during the treatment is to get it done at a well-established salon that has proper ventilation as this prevents concentration of the agent in the air. Use of facemasks by the client and the stylist is a necessary precaution. The Keratin treatment does have great results that can’t be discounted ~ natural looking shiny hair, that’s easy to manage. For women with coarse, frizzy locks, this could reduce the time taken to style your hair by 40-60%! Be an aware consumer and always research online before getting any chemical treatment. If done in a safe manner, your hair will thank you for getting this wonder treatment done! Check Out: How to Take Care of Chemically Treated Hair! Is it a Yay or Nay to the Keratin Treatment? We never said nay to the Keratin treatment, despite all the controversies, it’s still so much in trend and we, however can not ignore the after effects (super smooth, frizz free, shiny locks) it gives but we should set a certain limit for the treatment and opt for more safer treatments out there which gives the same *straight-hair* look effect like Keratin! And we certainly, don’t encourage doing Keratin treatments at home with the at-home kits available in the market (it should always be done under an expert supervision) which can be highly dangerous and it’s a strict no-no for pregnant and lactating women. The better and safer alternative to Keratin treatment would be Cysteine treatment (a latest smoothening method introduced in the category of Straightening treatments which is getting all the hype as it does not use any artificial chemicals that can be harsh on the hair). The cost of Keratin Treatment can be somewhere between 7000-8000 for medium length hair! Next Next post: Go Weightless with Lakme 9 to 5 Weightless Mousse Foundation!